This week Coca-Cola announced that for the first time in the brand's history all Coke's key variants will be united in one global creative campaign, “Taste the Feeling.” This follows the move last year to create a more coherent and consistent brand identity (see below), that I previously posted. Below I look at the potential benefits of this approach. For many years Coke has managed each of its drinks as separate brands, each with its own communication campaign, brand idea, slogan and tonality (see below). 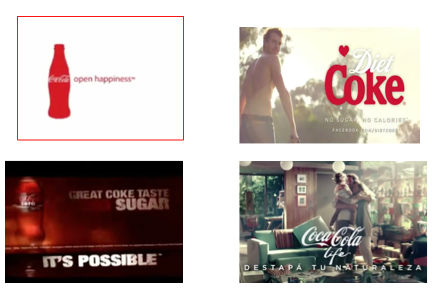 In last March's post I said "this approach fragmented Coke's money and talent over four different products which are at the end of the day just different types of cola". And it seems that Chief Marketing Officer Marcos de Quinto shares this view (perhaps he reads the blog?!). "The different brands have sometimes contradicted the personality of Coca-Cola... undermining completely the fundamental Coca-Cola brand promise," he said in a Marketing article. 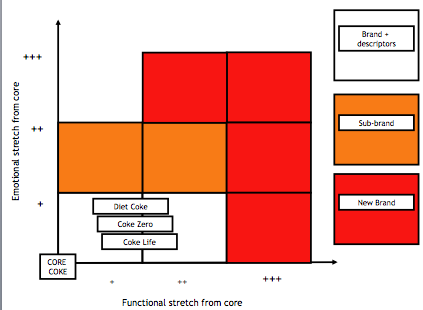 In last year's post I used our brand stretch framework below to suggest that the optimum architecture was to use the Coke brand plus a descriptor, given that the stretch from core Coke is limited both in terms of product and personality (influenced by the new product sector, the target consumer and the price point). I said at the time "I was never convinced of the need for multiple Coke brands. There is no real difference in product appearance, price position or pack format". And again it seems Marcos is thinking along the same lines, saying “Coca-Cola is one brand with different variants, all of which share the same values and visual iconography. In re-focusing on the master brand, with red Coke as the hero product, Coca-Cola is "following the money". 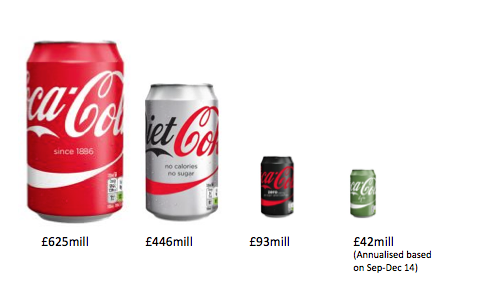 Coke and Diet Coke account for 90% of the business in the UK, and I reckon the sales split is similar in other markets. Coke Zero has struggled to get close to the objective set at launch of being as big as Diet Coke, as I suggested it would back in 2006 and again in 2010. And Coca-Cola Life is small at the moment. Time will tell if it is a "dwarf", doomed to stay small, or a "toddler" (small but will grow big). David Taylor is managing partner of the brandgym. Read more from him in our Clubhouse. BT's EE takeover: biggest brand challenge of 2015?